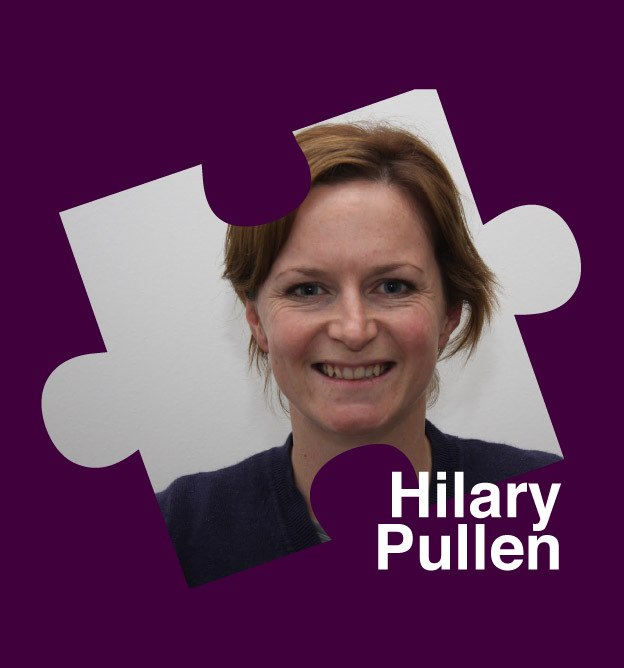 The third of our craft trio to join the Craftivist Jigsaw project with craftivist Sarah C, Mr X Stitch and Deadly Knitshade is Hilary Pullen, also known as haptree online, a social media manager with a passion for craft and supporting the ethos of the handmade marketplace. She writes blogging tips at www.ukcraftblog.com, a website which now sees in excess of 30,000 page views per month, along with a crafty Twitter following fast approaching 10,000. A bit about Hilary: I write Craft Blog UK, a blogging directory with tips and tutorials for creatives looking for digital marketing advice. Why do you love craft? I love the skill involved in creating something and the enjoyment of the making process from concept through to the finished object. The fact that handcrafted objects are usually more environmentally friendly is also a big plus for me. Can you tell us about your favourite piece of your own work? This simple little purse (right) is my favourite because I made it for my mother. She still has it with her all the time and I hope that it makes her think of me when she gets out her phone. 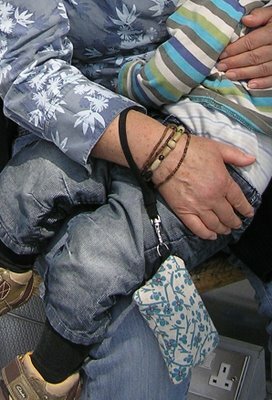 The picture shows her holding my little boy and wearing a bracelet my daughter made for her too. Can you recommend someone who is doing craft work you admire and explain why? 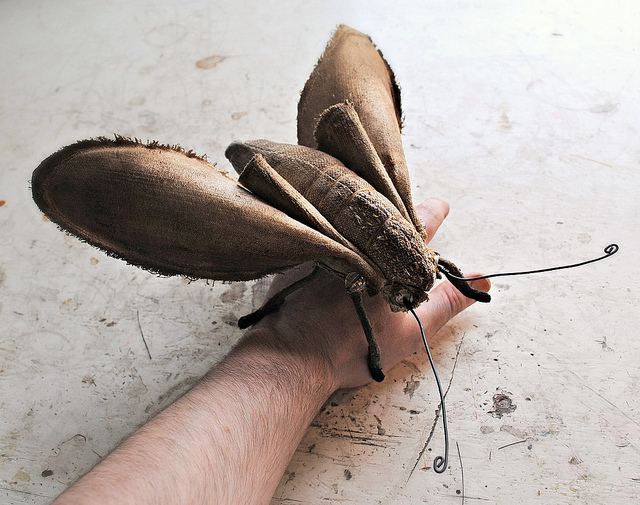 I love the work of MisterFinch (below). I run a Flickr group that he’s a member of and when I saw his work for the first time pop up in the group pool it really took my breath away – and you don’t get that kind of reaction that often! I just think the attention to detail is amazing. What you love about craftivism? Craftivism is not shouty and aggressive, I like the emphasis on one to one engagement. The process of creating something meaningful and beautiful benefits both the activist, the viewer and hopefully many more people as a result. I’m really excited about getting more people involved and making some really thought provoking pieces to share with them and my MP, David Gauke. Why did you decide to get involved in this Save The Children Campaign? I want to be involved with this project because I have recently learned that by committing to put hunger at the centre of David Cameron’s G8 agenda for 2013, it will definitely make a positive difference to millions of childrens lives. Malnutrition is a political issue and I want to do my part to put a little friendly pressure on our politicians to ensure this issue is tackled head on when the most influential people in the world get together with our Prime Minister in 2013. I cannot begin to conceive the pain and anguish of one of my children dying or being irreversibly damaged for the rest of their lives as a result of going hungry, and I certainly can’t imagine anyone standing around and letting that happen. Hunger is a political issue with a political solution. We have enough food for everybody, yet one in four of the world’s children is hungry right now. Education increases our ability to thrive, malnutrition reduces our ability to learn – Hunger destroys economies as well as lives. I chose these 3 (I may do many more) because I’ve realised what is important to me is that this isn’t something that “just is the way the world is – isn’t it sad and depressing, someone should really do something” – we can actually make a difference ourselves through the political decisions we make or minor changes to our lifestyle choices. It’s just a case of learning how each one of us can make an impact, regardless of our own bank balances. I’ll be convincing every single one of Craft Blog UK’s social network fans and followers that by making an #imapiece puzzle piece for their MP they can be part of the solution! I’m also hosting a little stitching party for my local friends at my house on fireworks day, I hope it’s a coffee morning they will remember. For more information about Hilary and Craft Blog UK go to the website http://ukcraftblog.com, check out the tweets @craftbloguk, and Facebook page here.